Ethan Allen selected DPCI to develop its digital asset management strategy then implement North Plains Telescope to support the company's transition to an all-digital environment. Ethan Allen Interiors Inc. is a leading manufacturer and retailer of quality home furnishings. The company, which recently celebrated its 75th anniversary, sells a full range of furniture products and decorative accessories through a network of design centers in the United States and abroad. Today, with more than 3,000 design consultants working in over 300 Ethan Allen design centers, Ethan Allen has evolved as a leader in providing one-stop interior design solutions. To support the selling and marketing of its products, Ethan Allen produces a variety of catalogs, direct mail and other collateral. In addition to distributing these printed materials, Ethan Allen wanted to revamp and expand its online presence. 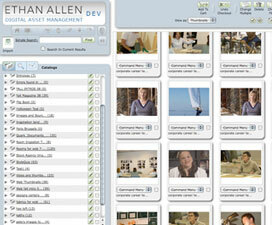 Until recently, Ethan Allen had been managing an all film-based photography workflow. Ethan Allen's production and photography departments found the old film-based approach to be cumbersome and not user-friendly, often leading to delays in the creative and production process. As the company's requirements evolved, Ethan Allen sought to transition to digital photography, which resulted in the need for a digital asset management solution to store and organize the dramatically increased volume of assets. After the selection and procurement process had concluded, DPCI's integration team met with key Ethan Allen stakeholder groups to determine the company's configuration and customization requirements for TeleScope Enterprise. DPCI configured the TeleScope system to Ethan Allen's specifications and developed customizations to establish the digital asset management system as the central hub for all asset distribution. One of the customizations developed by DPCI was a utility to convert photography requisition and merchandiser Microsoft Excel spreadsheets into metadata. On bulk asset upload, the data from these spreadsheets populates the metadata of the corresponding assets. With this utility, Ethan Allen can leverage the large amounts of data they had already been recording. Additional customizations developed by DPCI use this metadata to link together related assets, such as product shots in relation to larger room composition shots. Because up-to-date product information is essential to Ethan Allen's style, design, photography, and Web workflows, DPCI configured the TeleScope Lookup Broker to connect to Ethan Allen's AS400 system which stores this information. DPCI further customized the connection to synchronize data between TeleScope and AS400 on a nightly basis. Now, TeleScope users at Ethan Allen can determine if a product in a photo has been discontinued, or if other product information has changed. For asset distribution, DPCI developed a customization that exports assets from the TeleScope system with all metadata as XML. Ethan Allen uses this customization to deliver assets and metadata automatically to its new Web content management system. "What started as a project to implement a digital asset management system to manage Ethan Allen's images quickly became a project to leverage the full potential of TeleScope," said Ivan Mironchuk, DPCI's technical services manager. "We've created a centralized hub that serves as the traffic controller for all assets to be managed and distributed in Ethan Allen's digital workflow."